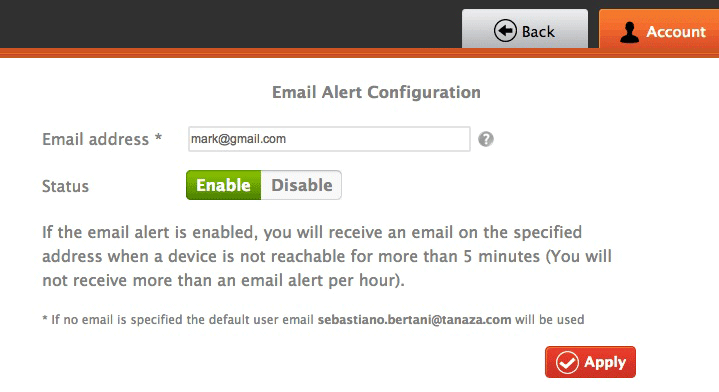 Many users requested alerts: “receiving an email when an Access Point dies would help me a lot and would add huge value to the Tanaza cloud management solution”. This has been the typical feedback from more than 50% of the users. Adding a feature like this took some time: Tanaza allows managing a wide variety of Access Points, and there is not just one way to monitor the status of all of them. Tanaza Powered APs such as UniFi, which can embed the Tanaza Agent inside the firmware, are monitored through a proprietary protocol that leverages keepalive-like packets. They are very similar to SNMP packets and includes statistics information too. If the Tanaza Cloud Infrastructure stops receiving those packets, the device is considered off-line. Tanaza Compatible APs, which carry their original firmware, and support SNMP, such as Ruckus Wireless or Engenius ones, are monitored through SNMP: the Tanaza Agent deployed in the LAN of the AP asks in polling the status through an SNMP request. If the device does not answer to the SNMP, it’s considered off-line. Access Points that carry their original firmware but do not support SNMP, such as some TP-Link models, are monitored through a simple PING executed by the Tanaza Agent depoloyed in the LAN of the AP. If the AP doesn’t answer to the PING, it’s considered off-line. In all cases, there is an inhibition to avoid fake positives messages: the device is usually in ONLINE state (GREEN); if it gets disconnected for more than 30 seconds, it goes to WARNING state (YELLOW). If it continues to stay off-line for 5 minutes, it is then considered DEAD (RED) and an email is sent. This avoids to receive an email if the ADSL of the customer is reset, which would generate a transient warning. A second anti-email-storm measure consists in a mechanism of aggregation of the emails sent: if multiple devices die at the same moment, a guard-time before sending allows to aggregate them in a single mail. A third mechanism creates an inhibition that postpones any email alert avoiding to receive more than 1 email per hour. Seems complex? Just consider that all of this is done by Tanaza in the background. What you have to do, as a user, is just turn on the feature and enjoy your updates in real-time. Get control of your network, wherever you are. To turn the email monitoring on, just go to cloud.tanaza.com, login and go to ACCOUNT / EMAIL ALERT: you’ll see a screen like the one in this picture and you’ll be able to specify the email address to which you want to receive the alerts. Click here for direct access to this page. If you like this feature or have suggestions, please write a comment in our community website: community.tanaza.com!